You look at a word long enough and it shows you some of the other things it can do. Like what happened a couple of days ago with “park”. As if you hadn’t noticed before, suddenly it revealed itself to be a verb. And out of that “to park” new thoughts emerged: about stillness, about change, about the differences between the built environment and the “natural”. At the end of family meals, especially on Passover, and only if the more religious uncles were present, those who wanted to would bench. We’d be lounging around the table, full of lamb and sweet potatoes and gefilte fish and chopped herring and chicken soup and thinking how stuffed we were and wouldn’t it be nice to be transported back home, to bed, and then someone would say: “So, should we bench?” As if we could have eluded it, as if we might have finished the evening without that added saying of after-dinner grace. And so the benching would begin. A mumbling of prayers, always one person leading, setting the pace, saying some of the prayers aloud that needed to be said aloud, and the rest of us would chime in: Amen. It’s a Yiddish word, probably linked to benediction, and probably more correctly spelled as bentsch. There’s a Yiddish saying that goes: Ess, bentsch, sei a mensch. Not too far from Eat, Pray, Love. And in some way a (park) bench is a place for prayer, if we think of prayer as a space of time in which we make contact with the universe (or god), and give thanks, or wish for something, or just meditate. A bench is a pause, a comma, a caesura; it sits on the edge of a path, like a line beneath the line, waiting for the word. And when the word appears, the underlining is there to accentuate it. Notice me! For the duration of our sitting on the bench, we are underlined. We stop, we take stock, figure something out, observe. It’s a concentrated moment in time. Like prayer. To be on the bench is to bentsch. A benediction. My friend Sarah Salway collects pictures of benches on her site A Quiet Sit Down. Benches go well with writing, with getting ready to write, with reading. They are the pause that happens before a story begins, the pause that happens while a story is taking shape, becoming itself. A bench and a book go well together. A bench needs a backrest. A bench must be comfortable. A bench is best when made of wood, though the backrest, for me, is more important than the material. A wooden bench feels like part of the park, taken from the park, sourced from it, carved out of it, reshaped. 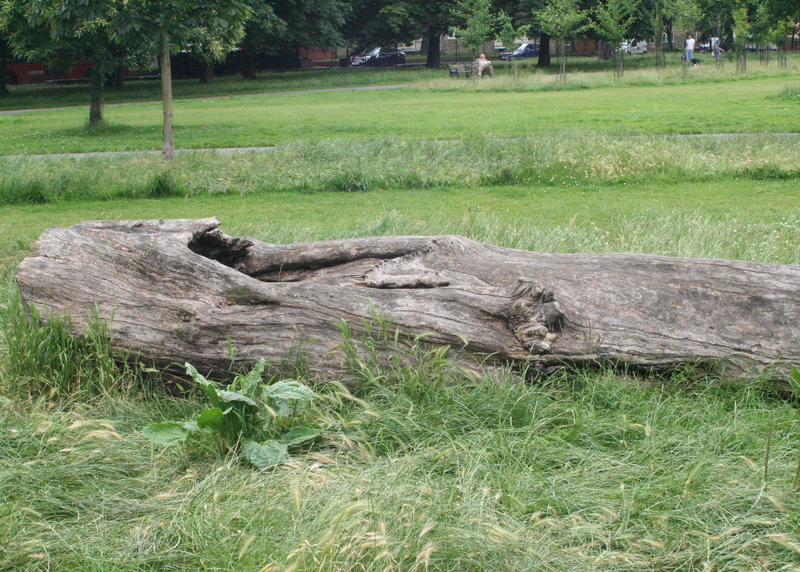 There’s a tree in Clissold Park that got blown down in a storm a few years ago. Now it lies there, its trunk, parked in the park like a bench, but without the backrest not so inviting to linger, to pray. Will somebody shape it into something one day? The making of a bench – a gesture of prayer. The dictionary says: A long seat for several people. So a bench is more pew than chair. A bench sits there for us to sit on, waits, untroubled by the weather (though it looks like the weather, like an abrasive, is smoothing the trunk into bench-form). A bench is there for you to take a moment to orient yourself. When I met Jeremy Wood at the mapping conference on Saturday he told me about benches. He told me that he placed a GPS tracking device on a bench in Amsterdam and noted every few minutes where the GPS was saying that it was. I think that’s what he said. I don’t know much about GPS and I’m not a geek, and I’m not the greatest of listeners when someone is handsome. I tend to zone out into somewhere pleasant, a bit, I guess, like sitting on a bench. But it was something about recording where a GPS tracking device thinks you are, even when your position doesn’t change. And then he added more benches in the places that the tracking device said they were. Or something like that. There’s more about the project here. One of the puzzles at the heart of his work seemed to be the question: Where am I? And maybe also the request: Tell me where I am. A bench is the perfect place to explore that question, a pause in the narrative, an underlining that is also brackets and highlighting, a stillness in time and place to figure out what am I doing, what are the other things I could be doing, a place to stock up on thoughts and possibilities, to have a moment when it’s just you and the sky, before stepping back onto the path. This is delightful Shaun. I love the analogy of a bench as parts of writing, especially the underlining on a line waiting for a word. Got me thinking what would be an analogy for a semi-colon – my favourite piece of punctuation. Looking forward to working my way through your other writings now I know where to find them. Thanks, Michelle. Yeah, I really like semi-colons, too. I kind of feel guilty when I use them, but I do enjoy a semi-colon well-placed. Kurt Vonnegut said horrible things about them!